Love me some pesto! It's great on chicken, grilled vegetables, on a flatbread, and of course, on pasta. 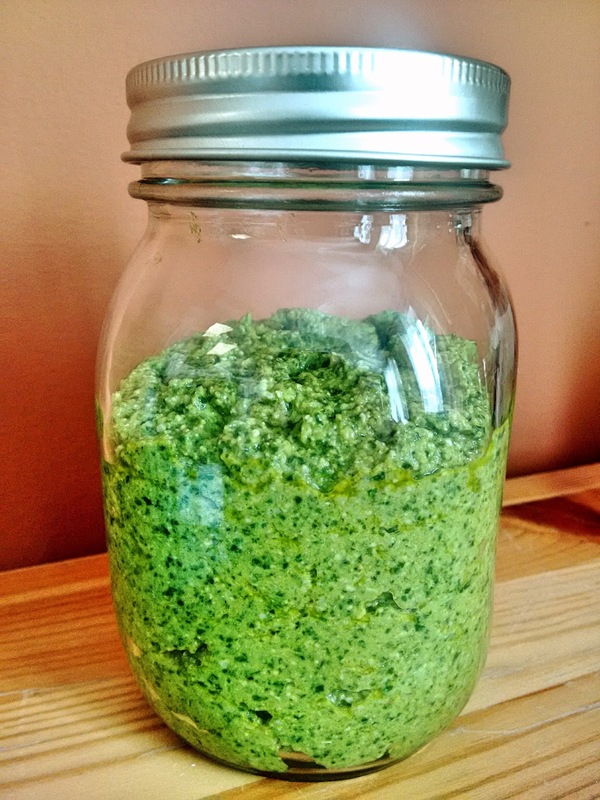 Pesto is a great alternative to marinara sauce if you are trying to reduce added sugars in your diet, plus one serving contains 10.8g of heart healthy unsaturated fats, and 6.3g of protein. Be sure to keep an eye on the pine nuts when you are toasting them. I turned away for a few seconds...they were burnt, and I had to toast a new batch. Not the worst mishap that can happen in the kitchen, but you know, pine nuts are on the pricey side! In a frying pan over low to medium heat, toast pine nuts until fragrant, stirring constantly. Set aside to cool. In a food processor, combine all ingredients and blend until uniform.